Bertrand Russell, one of the great intellectuals of his generation, was known by most as the founder of analytic philosophy, but he was actually a man of many talents: a pioneering mathematician, an accomplished logician, a tireless activist, a respected historian, and a Nobel Prize-winning writer, to name but a handful. 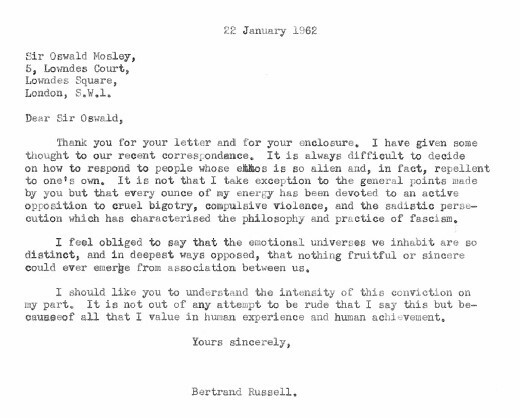 When he wrote this principled letter at the beginning of 1962, Russell was 89 years old and clearly still a man of morals who stood firm in his beliefs. Its recipient was Sir Oswald Mosley, a man most famous for founding, in 1932, the British Union of Fascists.